The ebook gift card market may have largely fizzled here in the US (the money seems to be in bulk sales), but that is not the case in Europe. For example, the startup eBookCards boasts that they distribute ebook gift cards to over 300 stores in Germany, and today Snapload announced that they have new contracts with two additional publishing conglomerates. Snapload, a subsidiary of Audio Media (Munich), announced on Tuesday that their SnapCards service had gained the support of Random House and Bonnier. 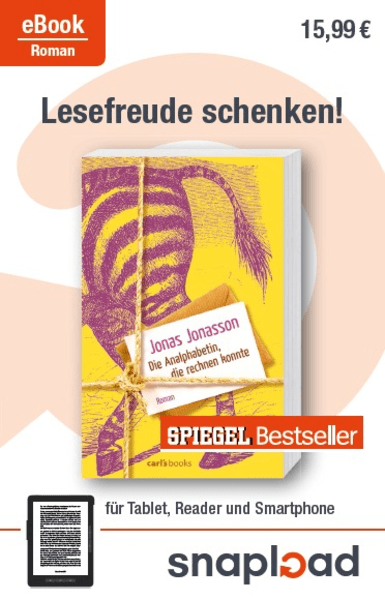 Soon readers will be able to go into a German store and buy a gift card for titles including Bridget Jones, Die Känguru-Offenbarung, or Der Hundertjährige, der aus dem Fenster stieg. SnapCards was launched during the Frankfurt Book Fair last October, but it only came to my attention today. The service supports both ebooks and audiobooks, and claims to offer 350,000 titles from publishers including dtv, Bastion Luebbe, and argon. The cards can be bought in a number of stores in Germany, including Müller drugstore, Globe, Valora, the Mayersche bookstore and the Tank & Rast service stations. Snapload offers two types of SnapCards: gift cards with specific titles or generic gift cards. Their competitor eBookCards offers similar cards, albeit without the option of audiobooks. eBookCards has a catalog of nearly 200 titles, and they also offer what they call a Joker card. This can be customized to match any of 250,000 ebook titles. The Joker card draws on the catalog of the ebook distributor Epidu, one of eBookCards investors. Once a customer buys a SnapCard, they can take it home and download the ebook at their leisure, or of course give it away. The ebooks can be read on an ereader which supports Adobe DE DRM (I can't find details on the audiobooks). In comparison, the eBookCards catalog includes ebooks both with and without DRM. As you can see, the German ebook gift card market is much livelier than in the US. In North America there are two primary competitors, Calgary-based Enthrill and California-based Livrada. While I am sure both companies are healthy, neither can boast a distribution network as broad as that of eBookCards or SnapCards.